Rivers of Sound orchestra. Credit: Alice Gebura. Refrains build and fall, textured timbres churn, trancelike waves swell and crest. The rivers motif is fitting — there’s something liquid about these breaking waves of sound, a liquidity to these cascading drops of simple repeating melodic fragments. Iraqi-American trumpeter, santur player, vocalist, and composer Amir ElSaffarand his 17-piece Rivers of Sound orchestra announce they will perform their debut album, Not Two, in full this summer and fall. Not Two will be available indigital, CD, and double LP (with a digital download) formats on June 16 through New Amsterdam Records. 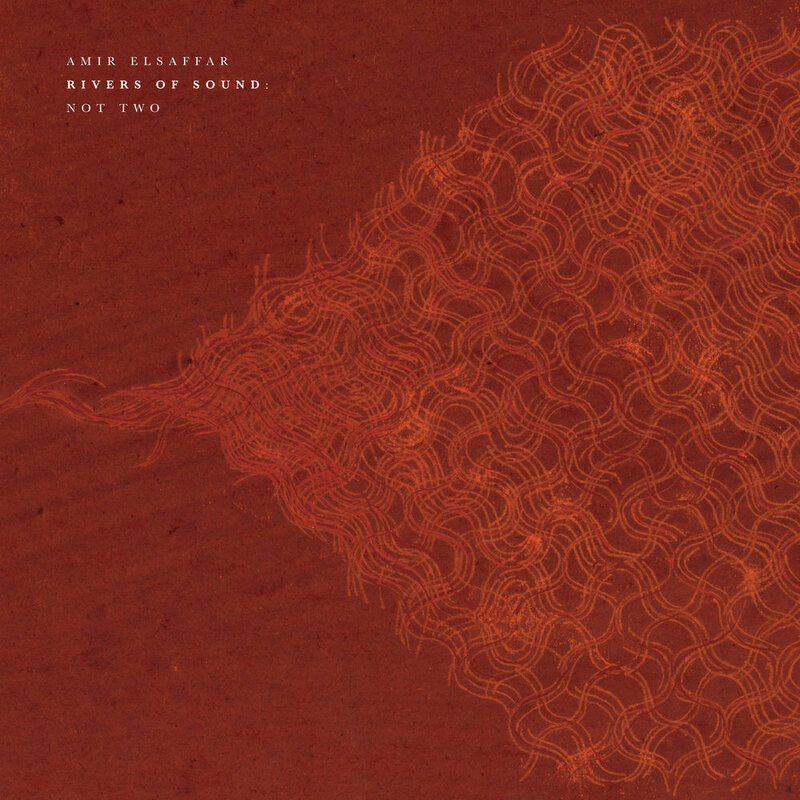 Pre-orders of Not Two are available here. ElSaffar has mastered disparate musical styles and created a singular approach to combining aspects of Middle Eastern music with American jazz, extending the boundaries of each tradition. ElSaffar's Rivers of Sound orchestra represents 17 musicians from a broad spectrum of traditions; together, the group creates an entirely new musical language that transcends established notions of style and convention. In performing Not Two, a composition by ElSaffar, each musician in the orchestra interacts with the group to create a new approach to transcultural music through the combination of improvisation and composition, the merging of musical languages, maqam and polyphony, and the novelty of the sound. ElSaffar and the Rivers of Sound orchestra will perform Not Two in its entirety at a free album release day performance at NYC’s River to River Festival on June 16 at The Plaza at 28 Liberty starting at 6PM, and at the Newport Jazz Festival on August 4 at 12PM. The group and full work will also be presented by the University Musical Society on October 18 at Ann Arbor, MI’s Power Center starting at 7:30PM. Using resonance as its governing principle, Not Two incorporates elements of maqam modal music of the Middle East with jazz and other contemporary musical practices to create a unique microtonal musical environment that moves beyond the notions of style and tradition into a realm of uninhibited musical communication. The highest ideal in maqam music is to reach a state of tarab, or “musical ecstasy,” which results from the melting away of borders between a notion of self and other, as performers and audience revel together in the music. As pitches and rhythms become fluid, so do cultural boundaries: elements that traditionally divide musicians and genre-specific modes are re-contextualized in a fresh transcultural soundscape. This ideal is central to the music on Not Two. The work sees microtonal maqam melodies traverse a richly-textured bed of sound created by oud, buzuk, and santur, in combination with cello, violin, saxophones, English horn and trumpet. Also at play are multi-layered, rhythmic patterns and harmonies performed by re-tuned vibraphone, piano and guitar. The drum set, mridangam, dumbek, frame drums and double-bass provide the rhythmic foundation and subdivisions of the multiple currents. ElSaffar also wrote the music with each musician’s sensibilities in mind, and encouraged everyone in the orchestra to consider the written scores as points of reference, beginnings from which they may improvise, vary, re-write, create their own music. This way, the music could be alive, unique to each performance, yet of a certain essence. The players bring their individual experience and understanding into the orchestra, their collective uniqueness combining to form a cohesive whole, allowing Not Two to approach something universal. As pitches and rhythms become fluid, so do cultural boundaries: elements that traditionally divide musicians and genre-specific modes are re-contextualized in a fresh transcultural soundscape. ElSaffar has previously forged his novel approach to combining musical languages through his six-piece ensemble Two Rivers. Over the past eight years, the group has released three CD's on Pi Recordings. Not Two is a continuation of the Two Rivers concept, but projected onto a wider canvas unprecedented in scope and imagination. “Rivers of Sound is not concerned with “bridging” divergent cultures. In each composition, one can hear elements of maqam, polyphony, polyrhythmic structures, melisma, and groove. But these do not exist as separate entities “belonging” to any people or place. After spending much of my life playing and composing in diverse musical worlds, I question the idea of culture. My interest is in finding sonic realms that can embrace the phenomena found in the myriad musical languages, drawing upon sensibilities and materials of various idioms, but without the limitations of a particular genre. The idea is about fluidity: sounds flow into one another, overtones interact, as we come closer to a universal human sound. ElSaffar believes that the nature of this sound cannot be captured digitally and committed to all analog recording. The limited possibility of making edits when recording analog brought an intense focus to the players' performance in the studio, which is as close as possible to reproducing the feel of a live performance. ElSaffar received funding from the MAP Fund and Arab Fund for Arts and Culture to create Rivers of Sound. In 2015, the 17 members came to New York City from as far away as Qatar, Palestine, and Brussels in April for three days of rehearsal, the premiere of Not Two at the Lincoln Center, and an epic 14-hour day at Avatar Studios, where they recorded the 80-minute suite directly to tape. The album was produced by ElSaffar, engineered by Sascha Van Oertzen, mixed by John Davis at Bunker Studios, and mastered by Scott Hull at Masterdisk. All compositions on Not Two were written by ElSaffar, whose work is published by BMI. Iraqi-American trumpeter, santur player, vocalist, and composer, Amir ElSaffar has mastered disparate musical styles and created a singular approach to combining aspects of Middle Eastern music with American jazz, extending the boundaries of each tradition. Recipient of the 2013 Doris Duke Performing Artist Award and the winner of the Carmine Caruso Jazz Trumpet Competition, he currently leads four critically-acclaimed ensembles: Two Rivers, which combines the musical languages of Iraqi Maqam and contemporary jazz; the Amir ElSaffar Quintet, performing ElSaffar's microtonal compositions with standard jazz instrumentation; Safaafir, the only ensemble in the US performing and preserving the Iraqi Maqam in its traditional format; and The Alwan Ensemble, specializing in classical music from Egypt, the Levant, and Iraq. In addition, he has worked with jazz legend Cecil Taylor, and prominent jazz musicians such as Mark Dresser, Oliver Lake, Rudresh Mahanthappa and Vijay Iyer. In his native Chicago, he worked under conductors such as Pierre Boulez, Mstislav Rostropovich as a member of the Civic Orchestra of Chicago. ElSaffar has received grants to compose music from the MAP Fund, The Newport Jazz Festival, The Metropolitan Museum of Art, Morgenland Festival, Chamber Music America, the Jazz Institute of Chicago, the Jerome Foundation, Festival of New Trumpet Music (FONT), and the Painted Bride Arts Center in Philadelphia and has released four albums, Two Rivers (2006), Radif Suite (2010), Inana (2011), and Alchemy (2013) to critical acclaim. He has also composed for theater projects and film soundtracks, and appeared in Jonathan Demme’s Oscar-nominated film, Rachel Getting Married. In addition to his busy performance schedule, ElSaffar curates a weekly concert series at Alwan for the Arts, New York’s premiere center for Middle Eastern arts and culture and serves as the director for Columbia University’s Middle Eastern Music Ensemble. Learn more at www.amirelsaffar.com.